This outdoor post mount light will update the exterior of your home with its eye-catching design. Featuring a black finish and clear shade(s), this fixture will accommodate a variety of outdoor of dicor styles. With its easy installation and low upkeep requirements, this outdoor post mount light will not disappoint. The cornerstone of the Providence Collection is quality, and this outdoor traditional incandescent complete 3 head post light is no exception. Combining a classic imperial bronze finish and posh styling, you will find no better way to highlight the charm of your home. With the superb craftsmanship and affordable price this fixture is sure to tastefully indulge your extravagant side. Patewood lanterns have a modern shadowbox housing in a sleek Black finish constructed from durable stainless steel for years of reliability. 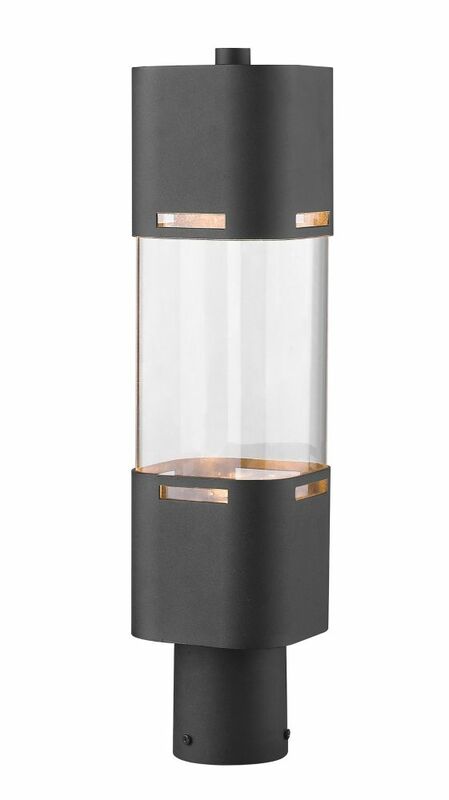 The pillar candle style diffusers provide a crisp illumination for a pleasing complement to your home's exterior. A fashionable white plastic finish combines flawlessly with white, making this Sea Gull Lighting outdoor post lantern sleek and sophisticated, while the energy saving bulbs make it practical. The 100 watt bulbs give off the ideal amount of light for any indoor application. If you are looking for a bold, new age accent for your home look no further. With its elegant lines and attention to detail, this Imagine LED series from SNOC is sure to impress your visitors and that contributes to save energy, reduce luminous pollution and protect the environment. LEDs consume less power, direct the luminous flux downwards and contain no mercury which are just a few among several major advantages. 1-Light Black Outdoor Post Mount Light with Clear Glass - 5 inch This outdoor post mount light will update the exterior of your home with its eye-catching design. Featuring a black finish and clear shade(s), this fixture will accommodate a variety of outdoor of dicor styles. With its easy installation and low upkeep requirements, this outdoor post mount light will not disappoint.